What better way to mark the return of the school year than with the absurdity of those over-the- top Juvenile Delinquent films of the 1950s and 1960s? HIGH SCHOOL CAESAR (1960) – John Ashley, who was about as menacing as Ned Flanders, plays a bitter rich teenage punk who runs illegal operations at his high school like a junior version of organized crime. The title is a reference to Little Caesar, the gangster movie with Edward G Robinson. Ashley’s JD character peddles the answers to exams, rigs school elections and bilks money from his classmates. All of this is played so seriously you will die laughing. There’s also the obligatory Drag Race and OF COURSE someone dies while drag racing. My Bad Movie page has a full-length review of this one if you’re interested. SHAKE, RATTLE AND ROCK! 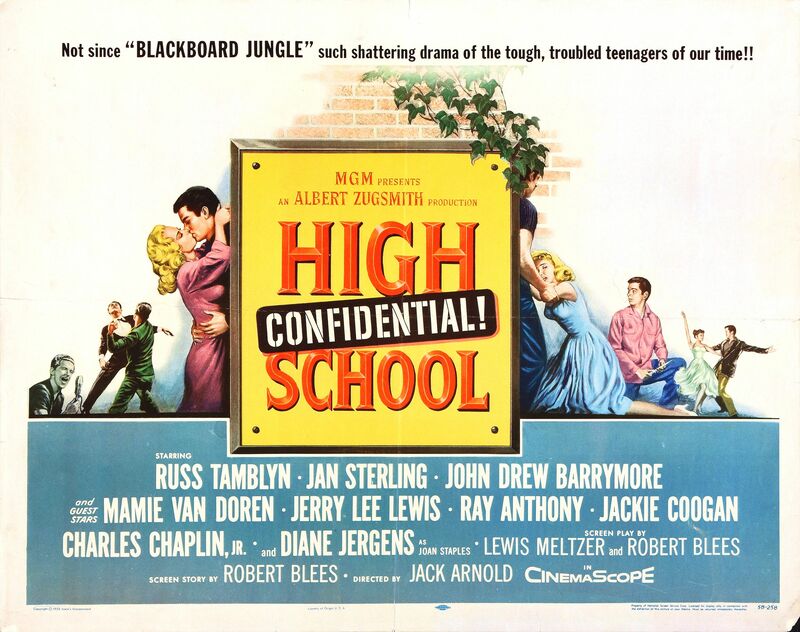 (1956) – In this hilarious movie Rock and Roll music is blamed for the Juvenile Delinquency epidemic of the 1950’s. Not only does one particularly irrational city ban rock music completely but it puts the local rock DJ on trial! Before MST3K there was The Texas 27 Film Vault! Balladeer’s Blog continues its examination of this neglected cult show from the 1980s. Randy Clower, Richard Malmos, Ken “Tex” Miller and Joe “The Hypnotic Eye” Riley played machine-gun toting members of the fictional Film Vault Corps (“the few, the proud, the sarcastic”) who would show and mock bad and campy movies preceded by episodes of old Republic serials. They would also have comedic sci-fi adventures before and after commercial breaks. ORIGINALLY BROADCAST: Saturday September 7th, 1985 from 10:30pm to 1:00am. SERIAL: Before the movie our Film Vault Technicians First Class showed and mocked a chapter of Flash Gordon Conquers the Universe (1940). Balladeer’s Blog continues its examination of this neglected cult show from the 1980’s. Randy Clower, Richard Malmos, Ken “Tex” Miller and Joe “The Hypnotic Eye” Riley played machine-gun toting members of the fictional Film Vault Corps (“the few, the proud, the sarcastic”) who would show and mock bad and campy movies preceded by episodes of old Republic serials. They would also have comedic sci-fi adventures before and after commercial breaks.